At 9:10am on this cool, misty morning, a gooseneck trailer pulled up to a small picturesque farm in Harvard, and out stepped dear Hayley, a 22-year-old Quarter Horse mare who has thrived under the gentle auspices of the dedicated volunteer staff at Bay State Equine Rescue (BSER) since they picked her out of an auction (and probable death) more than two years ago. Just five short weeks ago, Hayley seemed to be on death's door. She had long suffered from heaves, and now that condition was compounded by the onset of heart failure. Her prognosis was extremely grim. But Hayley had plenty of life left yet, as she let us know, both through her tremendous spirit, and the messages I had received during telepathic conversations with her. This dignified former PMU mare began to respond to the treatment prescribed by veterinarian Dr. Mark LeDoux, and she slowly, steadily rebounded. Virtually everyone who meets Hayley falls in love with her, and I was definitely smitten. 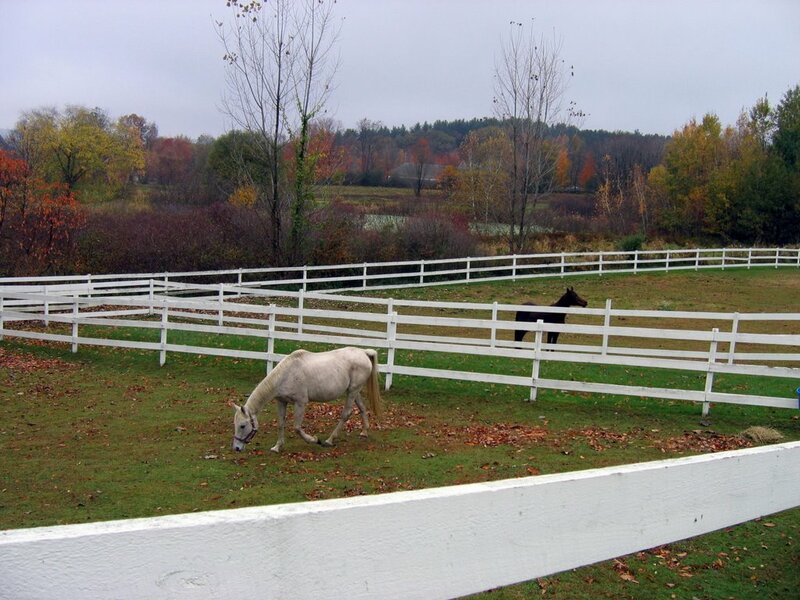 And today, thanks to the help of my good friend and colleague, Gwen Cook, and the support of Susan Sheridan of Bay State Equine Rescue, I adopted Hayley, who is shown here exploring her new paddock under the watchful eye of Gwen's gallant Arab gelding, "Back Bey." Perhaps the most remarkable thing was that Hayley took the move from her previous quarters in Oakham completely in stride, much to the amazement of all in attendance. 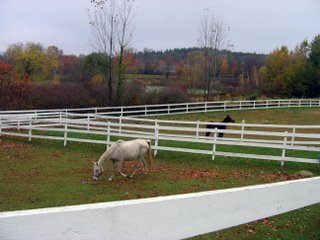 I had communicated with her the night before, explaining that she would be leaving in the morning to go to a wonderful new home, and showing her mental pictures of the barn and her new equine companions. I had pointedly stressed how much she was loved and how well cared for she would be. To anyone who saw how nonchalantly she simply looked around and immediately began grazing, it was apparent that she had completely understood. Thanks to our telepathic chat, the new barn was already familiar territory. Within minutes, she let us know she was home. I just want to let you know I am sitting here, reading about Haley, deeply touched at a very dear and near spot in my heart. What a lovely mare!!! And what a coincidence. I own a similar mare, a flea-bitten grey Arab/QH mare over 22 years old at least, no papers, that would have otherwise gone to the auction because nobody wanted her, and people thought, she had "issues". I agreed, when I first saw her, that she DID indeed have issues, but I felt in my heart, that only, because people had issues with her. I have no idea of her past, but suspect that her past wasn't easy. But I took her under my care, and as it turns out, it has been very rewarding. Best wishes to you and Haley. I've stopped crying now.